I once had a vision about the streets of Kraków. 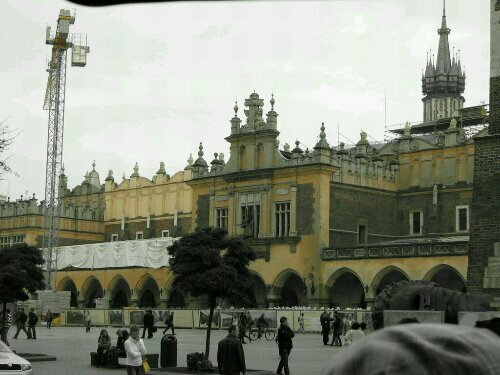 I was standing in the main square (pictured above) looking down Floriańska Street, one of the main walking streets leading to the main square. I remember I was prompted to close my eyes and begin praying. As I prayed I felt a warm breeze begin and I could see a light growing stronger through my eyelids. I began to spin around and opened my eyes to see very bright streams of light coming down each of the many streets that enter the square. I heard the Holy spirit tell me, this is the abundant love I have for the people of this city. I was overwhelmed by the sheer awe and beauty these streams of light had. Then I began to notice that the other people around me were going about their business, not noticing the amazing display of God’s love around them. Then the Holy Spirit took me up above the square, there I saw the streams of light twisting and turning all throughout the city streets. From the hill of Wawel castle and the Wisła river to the old Jewish quarters of Kazimierz, the light enveloped the city. He showed me how his Light is all around for people to live in, they just need to be shown. This entry was posted in Personal accounts, Personal reflection, Poland, Travis' Thoughts and tagged God, holy spirit, Kraków, lights, Love, Poland, visions. Bookmark the permalink. ← Political labels don’t fit me.